You can select any of the first seven of these options in the Lock Screen option in Settings. Encrypting everything on your phone (the eighth listed option) has some serious implications. From the Apps Screen, tap the Settings icon. Go to the Lock Screen link and tap it. This brings up the options for locking your phone. Answer the prompts that appear to establish your security selection. For reasons that sort of make sense, your phone uses some terminology that can be confusing. 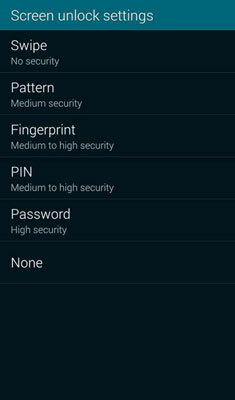 To clarify, the term Screen Lock is an option you can select to prevent unauthorized users from getting into your phone. The term Lock Screen is short for the action of locking your screen or enabling the Screen Lock option.